Human influence on the climate system is clear and growing, and impacts are evident on all continents. If left unchecked, climate change will increase the likelihood of severe, pervasive and irreversible impacts for people and ecosystems. We do have options to reduce risks by reducing greenhouse gas emissions and adapting to some climate change, but time is running short if we want to limit changes to manageable levels. Ignoring or misconstruing the overwhelming evidence is not a responsible risk management strategy. For the purposes of our coming coverage, we will assume that the scientific consensus about man-made climate change and its likely effects is overwhelming. We will leave the skeptics and deniers to waste their time challenging the science. The mainstream argument has moved on to the politics and economics. …to this huge, overshadowing, overwhelming issue of how climate change will probably, within the lifetime of our children, cause untold havoc and stress to our species. So, in the time left to me as editor, I thought I would try to harness the Guardian’s best resources to describe what is happening and what — if we do nothing — is almost certain to occur, a future that one distinguished scientist has termed as “incompatible with any reasonable characterisation of an organised, equitable and civilised global community”. That’s what a real newspaper does: takes on the big issues. 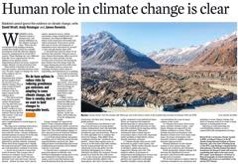 If the Dominion Post wants to be more than a Noddy book newspaper publishing rubbish from the intellectual heirs to Big Ears, it’s high time it took a sensible approach to the climate debate, and followed Rusbridger’s lead. Meanwhile, Bryan Leyland has posted what his web site describes as a “referenced version” of the text of the article that appeared last week. It’s available here (pdf), and is chiefly remarkable for the quality of what passes as references in crank circles. There are links to blog posts at µWatts and other climate crank sites, conspiracy-riddled pieces from extreme-right “news” services, and barely legible graphs. Where he does link to real science (on sea level rise), the underlying data doesn’t support the contentions in the article. Par for the climate crank Carterist “science” course, in other words. The Dominion Post still label the Wratt article as “opinion” though. It looked pretty factual to me. Did this (Wratt) article not make it into the Print edition? Too often there has been a sceptical article full of blatant lies, or misleading nonsense, with no right of response. Well done to the Dominion Post for publishing a reply to Leyland’s claims. People like Leyland are armchair critics, and can get away with writing nonsense or being misleading.He is self employed as an engineer and nobody is going to fire him for his climate change views. These sorts of people have really poisoned the debate, Moncton is another. In comparison people like Michael Mann know getting caught lying or being misleading will loose them their careers, or ability to publish. Leyland and Carter are coming back for another scalding. (just like the Black Knight of Monty Python)…. with their latest missive on Scoop Media via the Climate “Science” Coalition. If in doubt, double down, seems to be the motto of Leyland and Carter. They keep drumming the lie that there was no significant “warming” since 1997 ( have they not ever considered where 9x% of the warming ends up being stored..??). Adding up the various human warming and cooling influences around the globe must result in a figure that represents the net human effect on global temperature. But the effect is so small that it has yet to be calculated accurately, let alone measured; indeed, we do not even know whether the net human effect worldwide is one of warming or cooling. Where indeed have these two ignoramuses been all these years? What preposterous statement this is, given with no reference, no evidence and nothing to back it up but their personal opinion! What sad people indeed! What twisted minds! 3.3. Content submitted to Scoop must be well researched and written in a manner which reflects the best media standards. Which proves how dangerous these delusional fantasies of Leyland and Carter are. Obviously many people are interested to read more about the biggest issue that our civilization has arguable created for itself. It is therefore of paramount importance for media to stop publishing utter nonsense disguised as science. Leyland and Carter are not only far from the facts with their opinion, I believe that they are knowingly and very deliberately trying to derail the public opinion with fabricated nonsense for a political reason and, last not least, because they are known to be on the pay books of fossil fuel interests to do precisely that. Despite Carters well known funding sources he is lying about that too as clear from the evidence at hand (see link above). I’m sure, Andy, that will be a great comfort to the shattered peoples of Vanuatu and the Philippines – “Nothing to worry about here, folks, two old geezers (neither of whom are climate scientists) say these unprecedented storms are merely natural events”. Lots of fake hits from a couple of obsessive compulsives. I made the mistake of increasing the hit count by one, the article is so wrong it is embarrassing to the authors. Not the last word, it would appear. As you might expect, I will have more to say on this later today. For the time being, the interested might want to actually read Leyland and Carter’s piece and see to what extent it actually addresses my criticisms of the original. I always thought Dompost was a bit more progressive than NZHerald, but this is evidence against that. I’ve noticed that many newspapers now are starting to silence the climate deniers compared to the 2000s, which is a really good thing. Dompost needs to get with the programme. Th media is supposed to encourage *informed* debate.